The Airfix kit is a re-release of the old Gunze Sangyo kit. There's a lot of white metal & PE parts to fiddle with. I'm not an expert modeller by any stretch of the imagination but I think I'm up for the challenge of this kit. It's an old kit & it shows, the castings aren't pretty in places & the instructions don't exactly give a lot away either. How to make a wire wheel. I just dug mine out - the wheels are probably the best part of the completed model TBH. Considering the amount of effort required to complete it (even OOB) it's not that great. The rear wheelarch shape is totally wrong, and it's badged as a 4.2 when in fact it's modelled with a 3.8 engine (easily fixed by cutting the badge up BTW). Mine was also Airfix boxed - part of their infamous "Hi-Tech" range with white metal parts that had less detail than the plastic ones they were supposed to improve upon. Buried somewhere in the house I have the Monogram 1/8th scale kit XKE kit here, not in its original box but all the bits are there. One day I'll settle down & do it! I have one of these winging its way to me....can't wait! It is a big big model! The subframe/bulkhead will be primed then sprayed a suitable colour. I'm guessing you drilled the wishbone pivots out? Other thing is, before you finally glue it to the bulkhead, make sure its all flat and not banana shaped. Apparently it has arrived at my desk at work( day off today getting countertop fitted in the kitchen), so will have to wait till tomorrow , this will sit nicely with the James Bond Db7 I also have to build...ahem! 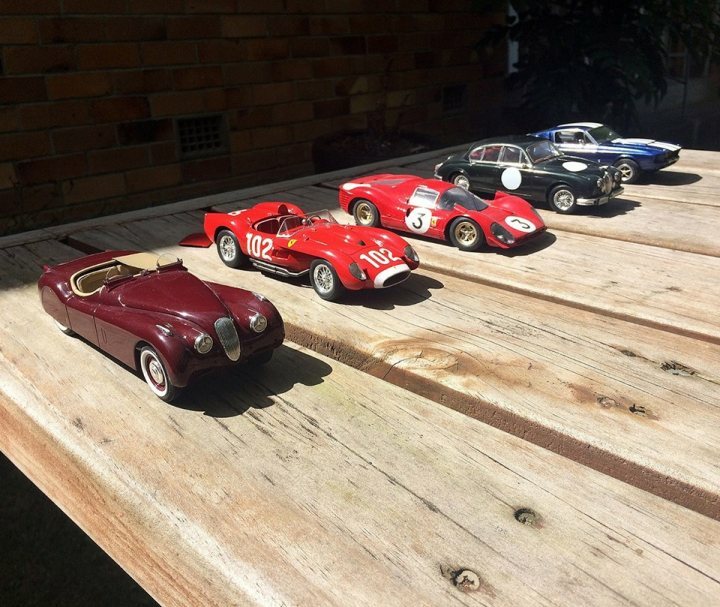 I was watching a gunze 1/24 E-type with the intent to bid, but it went way over anything I was prepared to pay ( eBay item 310646519107) it went for over 110 bucks! It's a shame there's absolutely no cast-in bulkhead detail, especially considering the level of detail on the engine/carbs etc. It would make a great project for adding things like w/w motor and throttle linkage etc. I got an Airfix Hi-Tech Series 250GTO some years ago from Modelzone for £5. Seems like a good buy now! Can someone please add step by step pics of how the wire wheels go together? I am just about to attempt...!!!! Now THAT'S a thread resurrection! I thought the picture of the instructions explained it very well. Maybe I'm a bit inexperienced. Would really like to see someone put one together. Terrified I will get one wrong and thereby ruin whole kit build. If this is one of your first kits, I’d recommend shelving it until you’ve had some practice. It’s a very tricky one to build, and even when complete it’s not the greatest model of an E-Type. I think there’s an all plastic version by Heller which might be better. But technology has moved on since then.